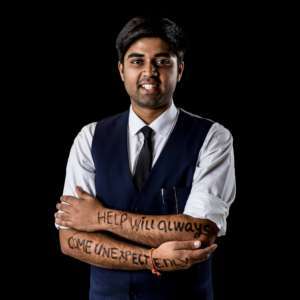 I would like to start off by introducing myself, My name is Sankalp Mohan Sharma and I am from India. I am an environmentalist and public speaker. Extracurricular activities are something that I always loved doing and being a part off and thus in middle school I had joined two clubs, the EPIC Club and the CMCA Club which is an abbreviation for Children’s Movement For Civic awareness of which I went on to becoming the president. As members of these clubs we were educated on the several environments based topics such as Climate Change, Water Conservation and Global Warming etc. We also wrote several National Olympiads such as the Green Olympiad. For the practical implementations of our knowledge we did various campaigns in school, from carrying out education programs and quizzes for junior classes, to working on recycling waste and segregating it on important functions such as the annual athletic meet, The Graduation Day etc. At the age of 13 I led my first successful campaign wherein me and my team segregated waste from school and collected 1 ton or 1000Kgs of Tetra packs and sent them for recycling to the TERI Recycling plant. With growing curiosities of the worsening situations of our planet, I would ask my peers and teachers a lot of questions to understand and find the real reason behind this huge thing everyone was talking about, “Global Warming” and even reached a point where my teachers were unable to help me or answer my questions. Being a passionate public Speaker I used to listen to a lot of ted talks and that’s when I stumbled upon the ted talk of the Nobel Laureate and the 45th Vice President of the United States Of America, Al Gore and his speech and presentation on climate change not only answered majority of my curiosities but also motivated me to step up and create change as Mahatma Gandhi once said, “You must be the change you wish to see in this word”. This is where my journey really started as an environmentalist. I signed up as a volunteer for his organization, Climate Reality Project. The Climate Reality Project is a diverse group of passionate individuals who have come together to solve the greatest challenge of our time. We are cultural leaders, organizers, scientists, and storytellers, and we are committed to building a better future together. I did several things as a volunteer, attended local events, helped with some campaigns, signed petitions and things of that sort. It was The June of 2016 when I decided to apply for the Climate Reality Leadership Training Program. This is a training program where environmentalists, sustainability experts, Scientists or environmental lawyers are selected to represent their countries, people with a lot of experience in these fields. With no hope of being selected, after a month, I was shocked to find an email of acceptance for the training program to represent my country India. I was ecstatic, and getting selected was an achievement in itself me. So in august I was trained for a rigorous 3 days in Houston Texas, by Senior Leaders such as Dr. Robert Bullard, often referred to as the “Father of Environmental Justice”, Dr. Susan E Pacheco Winner of the Champions of Change award and the first women recipient of the Green ring award, and also the Dynamic Al Gore himself to name a few. 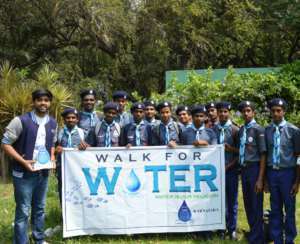 Sankalp Mohan Sharma is warning Indian Youth about clean Water. At the end of the training, I was awarded the title of Climate Reality Leader and also became India’s youngest Climate Reality Leader at the age of 15. The title is so important and motivating for me It gave me the drive to do more and more as a Leader for my country. It has been endless work to creating change since then. I spent the month of September as a leader to prepare a PowerPoint Presentation that I would deliver and practised presenting it over and over for a few weeks till I felt I was ready. In my presentation there are 3 parts, the first is about climate change and the problems we are facing because of it, this is to make the audience nervous and worried so they understand how bad the effects are. 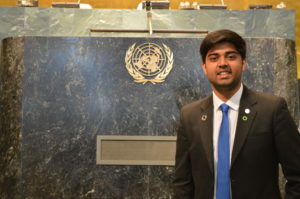 The second part is about its solutions, which gives a sense of relief and also makes the audience understand the urgent need for climate and environment protection and the third part consists of my journey as a climate reality leader to lead by personal example that if a 16 year old can work tirelessly then the audience can as well. I started off with my first ever presentation for the middle school students and their teachers and the following presentation for the high school students and their respective teachers, both with an audience of approximately 250-300 people. I took feedback from not only my teachers but from the students as well and thus improved in the best manner possible. Then I did presentations in Gurgaon, Delhi and continuously improvised my presentation as per the audience age group and background. I had separate presentations for school students, college students, corporate organizations, Indian army and veterans and used different styles of presenting to create a lasting impact. As I networked more and more, and gave presentations across india to audiences of each kind, I started getting offers from a lot of environment based organizations and NGO’s to work with them. It was the 27th Of January when the CEO and Founder of the Global Campaign “WALK FOR WATER” called me for a meeting and after a good and positive 2-hour interaction, he offered me the post of the State Head of Karnataka. I was rather overwhelmed as the heads of each state were all much senior to me in age as well as experience. I took the opportunity and promised to do my best as a Climate Reality Leader. Our Organization has helped restore more then 12,000 dried up bore wells across india and in now aiming as the large lakes that have dried up. After accepting this big role, it was unending work. Every day for the next two and a half months, I would study tirelessly just so I could get down to working, I would sleep for an hour from 3-4 at night and spend the rest of the day working, studying, contacting climate leaders, influencers and friends across the world to join the campaign and take the Water pledge and planned the main event for the 22nd of March. Every state head had 2 objectives, 1 – to contact as many influencers and celebrities from all fields and get them to take our water pledge and join our campaign. I contacted my network of environmentalists from across the globe and they all joined our campaign, and helped it be implemented in their countries as well. They shared pictures and images of the same which we used on our social media. I also met several sports legends, Actors, Actresses, Mrs India & Mr India pageant winner, government officials, Indian environmentalists and the list goes on. The 2nd aim was to host a grand walk in our state on the 22nd of March which is world water day and get a very senior minister to be a part of it and flag of the walk. To lead the entire state for this global campaign, I decided to make it completely youth driven in Karnataka. Thus, I started an internship for student leaders across my state. The word of this internship for Walk for Water was spread in every school and college and I got a massive response. After thorough deliberations, I selected 15 young leaders from colleges across Karnataka who were very dedicated & motivated to make a difference. Each of these young leaders were older than me and were interning for me, it is an overwhelming feeling I gave them weekly tasks, to spread awareness, attract sponsors, meet government leaders/politicians and partner with companies and Ngo’s etc. At the end of each week they would submit the work they have done as per the tasks assigned and as in when an intern was unable to compete tasks I would help them out to make the next week successful. The best performing Interns would win the Walk for Water Merchandise (Caps, shirts etc.). For the main day we started by Addressing The target audience was the main goal of the Water walk. I reached out to gardener’s, plumbers, cleaners, house staffs and other workers who dealt with water on a daily basis. These are the real change makers, who when educated/ made aware off, can practically make a change and spread awareness. I also approached the workers of Bangalore Water and Sewerage Supply Board (BWSSB) of several localities and districts and told them about our campaign, they helped us in spreading awareness and also partnered with us for the Main Day walk, wherein they got banners and all their members came down for the walk. They were also key organisers. Then along with my team I spread awareness about water conservation in several schools, government and private and several organizations and invited them to be a part of the main day. I as the state head partnered with the BWSSB and several other NGOs working in the field of water conservation and water protection. We worked for months tirelessly to have a successful, impactful and grand event. After tremendous work, we attained our first goal, we successfully got the location of Vidhan Soudha it is the seat of the state legislature of Karnataka. It is an imposing building, constructed in a style sometimes described as Mysore Neo-Dravidian. The construction was completed in 1956. The second and biggest aim that we achieved was having the presence of honourable ministers such as the Minister of Bengaluru Development Shri K. J. GEORGE, State chief commissioner of the Bharath Scouts P. G. R SINDHIA, and our Honourable Chief Minister of Karnataka Shri. Siddaramaiah. After countless rounds to government offices, weeks of work, and numerous permissions, our Chief Minister agreed to inaugurate our event and flag off the walk and this was our biggest success, as this naturally attracted almost every media channel and newspaper and a massive crowd. With an expectation of 800 participants, we had a great achievement, as there were 1500+ participants. This event in Bangalore was covered by all leading news channels and newspapers and we had started a global movement. In the final meeting of the Walk For Water heads it was concluded that the state that created the most impact was Karnataka and the best state head was given to me. I was then felicitated with The ARYAN YOUNG ACHIEVERS AWARD 2017, by The ARYAN INSTITUTE OF TEACHER TRAINING. I was nominated and eventually selected for this award by a group of 3,000 teachers from across India. This award was presented to me based on my work towards The Climate Reality Project as India’s youngest Climate Reality Leader, and my endeavours to conserve water. I also went on to winning THE AKHIL UDAY AWARD for Inspiring effort, I received the award for my continuous social effort and effort to aid several victims of accidents and for my work in the sector of gender equality and human rights protection. This year, In the month of May I was also shortlisted and appointed to work with the Human Rights Sanrakshan Sanstha of India, as the International Coordinator for India. I have been working since then and fighting for the Indians deprived of their Human Rights. 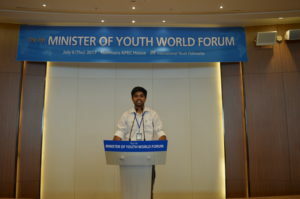 Sankalp Mohan Sharma in South Korea. I was also selected to represent the country at the Leaders Conference in South Korea by the International Youth Fellowship for a 2 week long program across the cities of South Korea wherein my team and I made a project for cleaning polluted water in South East Asia, for the countries of Indonesia and Philippines. We presented our idea/ project to the minister from across the world such as the ministers of youth and education, ministers of finance and ministers of the environment etc. we also presented to the several world education leaders who were the chancellors and heads of some of the most prestigious college from across the globe. The ministers and education leaders jointly accepted our project and my team and I won the best project award. It will be implemented in Indonesia and Philippines in the near future. Finally, Sir Al Gore, The 45th Vice President of the United States of America won the Nobel Prize for his Outstanding Book “An Inconvenient Truth” The Planetary Emergency of Global Warming and What We Can Do About It is a 2006 book by Al Gore released in conjunction with the film An Inconvenient Truth. It is published by Rodale Press in Emmaus, Pennsylvania, in the United States. Based on Gore’s lecture tour on the topic of global warming this book elaborates upon points offered in the film. The Sequel of this award winning book, written by Mr Gore was published this month and I have been featured, my photos and the information on the work I have been doing as The youngest Climate Reality Leader of India. I would like to conclude by Thanking The Youth Assembly and the Global Young Voices for giving me this opportunity to share my story. I really look forward to working with the Youth leaders that have been selected to represent their countries and cultures and are present here today. I wish to connect with all you future leaders to create movements not only in our countries, but together on a global level and lets help every country to attain the Sustainable development Goals by 2030. You can reach out to me after this session or on the details provided in this slide, (my last slide).I also want to thank Camilla Curnis and Alberto Curnis for helping me make this presentation a reality and the best of its sorts, thank you everyone and all the best to my fellow winners. 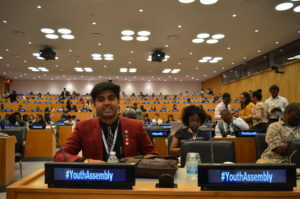 Sankalp represented India at The United Nations Youth Assembly in August. 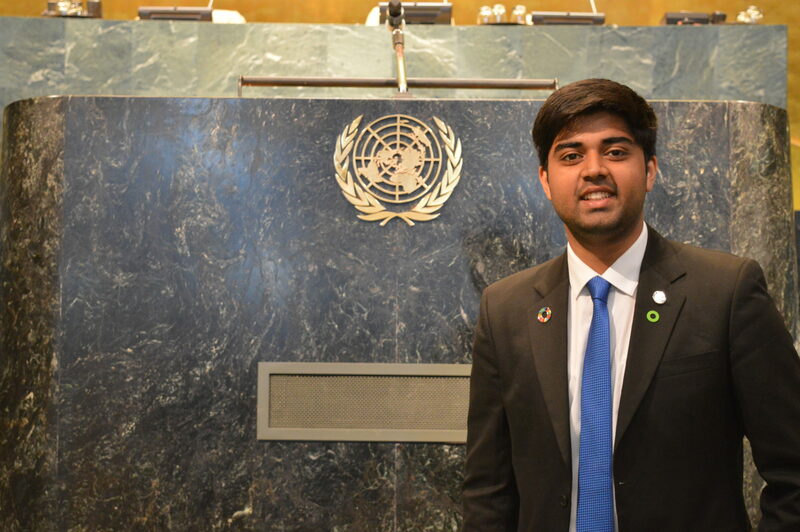 He ranked first from over 100,000 competitors for The Global Young Voices, and presented a speech at The United Nations Headquarters In New York.